Here are some really special Star Wars gimmicks all the way from Japan. 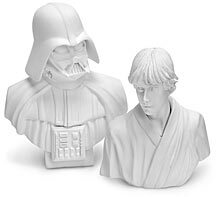 These are mini busts they come in 6 models with an average height of 3″. They are a special limited edition so when they are gone you will never see them again. For More Star Wars merchandise check out our friends at THLOG.com.